16oz. 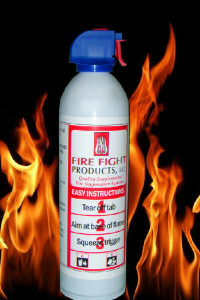 aerosol hand held system A foam 16oz. hand held fire suppression system, our SS20 is perfect to keep in your glove box, on the counter in your galley, next to the seat or basically anywhere you will be that you may need something to quickly knock down a small fire. 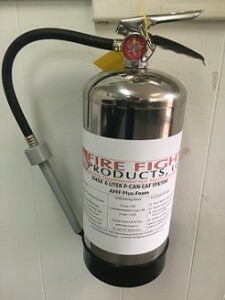 Charged with nitrogen, this distilled water based non toxic, non corrosive organic suppressant is the same fire fighting chemical used in our larger systems but in a convenient, small hand held format. At its modest price, you can have several of these spread out where you can get to one. $30 each you should never be without one of these by your side. SS450 P-Can Refill AFFF Foam 16 oz bottle $30 Enough for 2 refills at the recommended rate.